I can pretty much say I was disappointed at this movie. It just didn't have the "this is a very crucial event" factor to it. In other pokemon movies all the events had weight in it. In this one its just very light stuff. 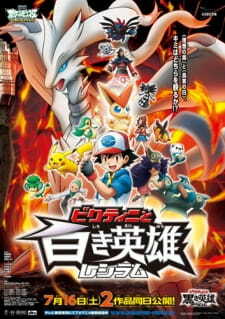 The action sequences are always the highlight of Pokemon movies.And in this one it had decent to bad action scenes. The supporting cast is very useless as well. They had no use in the whole thing unlike the previous movies. The only thing this had going are the Legendary Pokemon. Rashiram, Zekrom and Victini are cool Pokemon. Though I had a problem with the some of the animations and colors they used on them. The dub is pretty much just good as its always been. My biggest complaint is the plot. It is just stupid and useless for me. It seemed like they didnt plan the plot to well. Filled with loose ends and a subpar conclusion.By far this is the worst movie in the franchise and I hope they do a better job next time. The Pokemon Universe is filled with pokemon and I just can't see how writers cant think of better ways to use this vast universe. "Does the truth flow within you? Do you have what it takes to express your ideals?" The art and characters (as always, disregarding the digimon flying across the screen with jets) were good as always. The music (as always) are to die for. In fact, if I could watch this movie with no video and no voices and just the music, I'd do so a thousand times.